This evening, my son and I moved the Squiggly cache to its new home for July. Go to one of the many entrances to the Skarland 6 mile trail. If you start from upper campus, turn E-NE on the trail (towards Farmers Loop) until you reach the 1 mile sign for the Equinox Marathon. Go a bit further and you will see a small path on the right. Go down the path about 24 paces in (my son paced it off) turn left and about 10' off of the path at the base of a tree rests a stash of blue Squiggly chips. 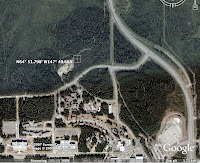 The jpeg here is an image from Google Earth showing its July location. The MBS complex is in the bottom center of the image. My son thought I should add - Warning, lots of mosquitoes! I found the cache with a slight modification to the direceions. The path, just beyond the 1 Mile Marathon marker, was actually on my right. Thanks for a good walk.